© 2017 DC Comics. The DC logo is a trademark of DC Comics. © Valve Corporation 2017. All rights reserved. Dota and the Dota logo are trademarks and/or registered trademarks of Valve Corporation. © 2017 WIZKIDS/NECA, LLC. All rights reserved. 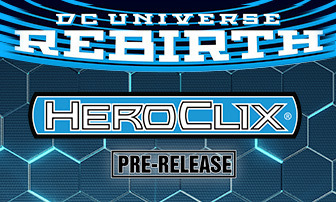 HeroClix, WizKids and Combat Dial are trademarks of WIZKIDS/NECA, LLC. © 2017 National Entertainment Collectibles Association, Inc. (NECA). NECA and related logos are trademarks of NECA. All rights reserved. Pathfinder, the Pathfinder logo, Paizo Publishing, and the Paizo logo are registered trademarks of, and Pathfinder Battles is a trademark of Paizo Publishing, LLC. © 2017 Paizo Publishing, LLC. © 2017 Valve Corporation. All Rights Reserved. Portal, the Portal 2 logo and the Valve logo trademarks and/or registered trademarks of Valve Corporation. TM & © 2017 CBS Studios Inc. All rights reserved. STAR TREK and related marks are trademarks of CBS Studios Inc.
© 2017 Valve Corporation. All Rights Reserved. Team Fortress, the Team Fortress logo, Valve, and the Valve logo are trademarks and/or registered trademarks of Valve Corporation in the U.S. and other countries. © 2017 Wizards of the Coast LLC All Rights Reserved. Dungeons & Dragons, D&D, Wizards of the Coast, Rage of Demons, Tyranny of Dragons, Elemental Evil, Forgotten Realms, Wrath of Ashardalon, Castle Ravenloft, The Legend of Drizzt, and their respective logos are trademarks of Wizards of the Coast LLC in the U.S.A. and other countries, and are used with permission. ©2017 NECA/WizKids LLC (WizKids). The marks and logos for WizKids, Dice Masters, Quarriors, Dice Building Game, HeroClix, and Combat Dial are trademarks of WizKids. All rights reserved. All other trademarks and copyrights are the property of their respective owners.